The Sub Aqua Club did more than their fair share of helping keep their city beautiful with a huge effort from their members in cleaning up the river Nore during the week. Our river Nore is one of our city’s amazing resources and this group of dedicated volunteers collected much as a result of others not appreciating it. 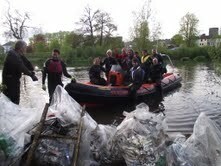 Throwing rubbish in the river does not make it disappear!!!!!! This entry was posted in Anti litter, Biodiversity, Clean Ups, Kilkenny City, News and tagged clean up, club, nore, river, sub, sub aqua by KKB. Bookmark the permalink.